Shake Shack burgers are insanely tasty. But if you want to buy the company's high-flying stock, you probably will need to keep a packet of Rolaids or Tums handy. The stock has tripled from its initial public offering price in late January. But it has been a bit of a bumpy ride. Shares surged early last week to their highest level since the IPO. The likely cause? Investors were hopeful that the muddled, vague turnaround plan announced by McDonald's could mean more sales for rival burger chains. Shake Shack (SHAK) wasn't the only burger stock to get a boost while McDonald's (MCD) stock fell. But the stock has plunged 17% from last week's peak. It rebounded sharply though after it reported solid results for the first quarter following the closing bell Wednesday. The stock surged 6% in after hours trading. Shake Shack's sales topped forecasts and it posted a surprise profit -- despite the rising cost of beef and other commodities. Shake Shack also posted extremely strong same-store sales gains. Still, there is absolutely no way to justify the stock's valuation for the long haul. 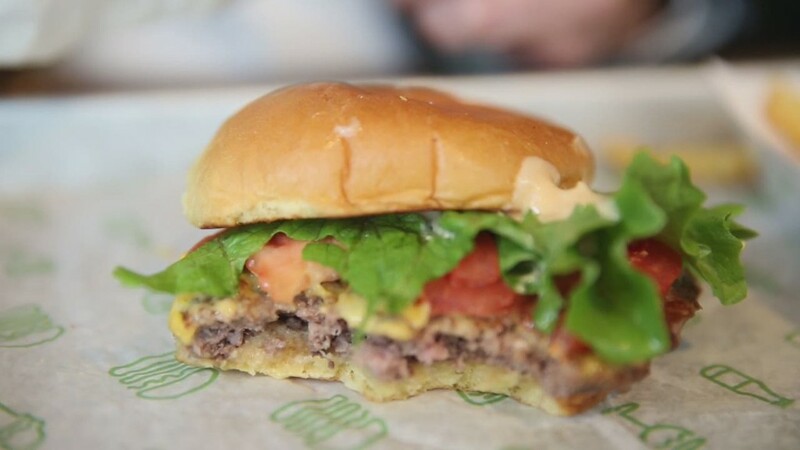 Shake Shack trades for more than 1,000 times 2015 earnings estimates. Compare that to Jack in the Box (JACK), another midsized restaurant stock that is also reporting its earnings Wednesday afternoon. It trades for just 30 times forecasts. Jack in the Box owns the namesake burger chain as well as Qdoba, a competitor to Chipotle (CMG). 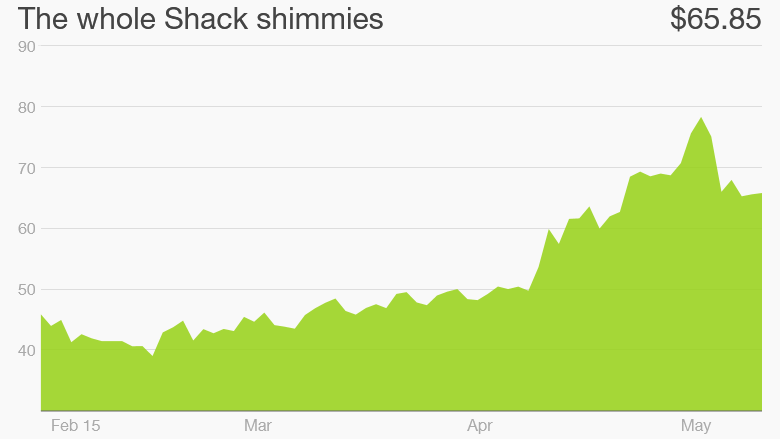 Yes, Shake Shack (like Chipotle) has a cult-like following. I consider myself to be one of its members. Applewood smoked bacon and chopped cherry peppers = culinary paradise. The company is also rapidly growing. It just opened a new store in Austin earlier this month and has plans to enter Tokyo and Los Angeles next year. The move into LA is going to be a very fun one to watch. 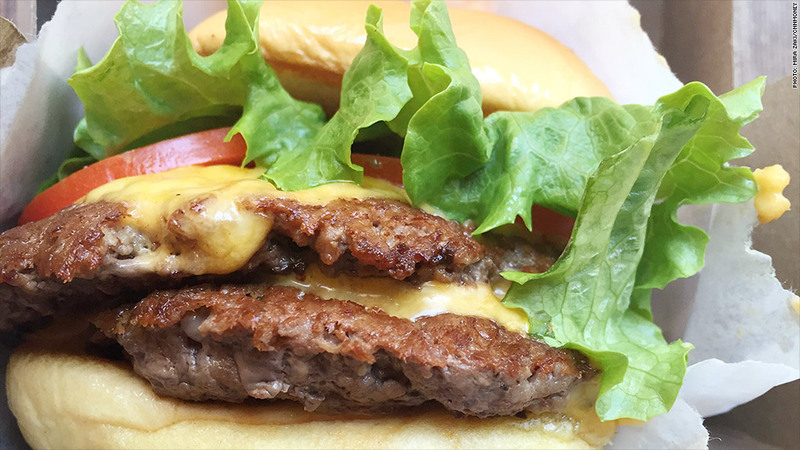 Heading to the Left Coast will put Shake Shack in direct competition with both Habit Restaurants (HABT), another better burger joint that recently went public and also has won raves for its food, as well as the legendary In-N-Out Burger. But investors seem to be confusing good food with a good stock. Everyone on Wall Street is, pardon the pun, hungry to find the next Chipotle. Shake Shack probably isn't it. Competition is much more intense for Shake Shack than it is for Chipotle. Forget about the fats. It's Shake Shack's core market that is already saturated.